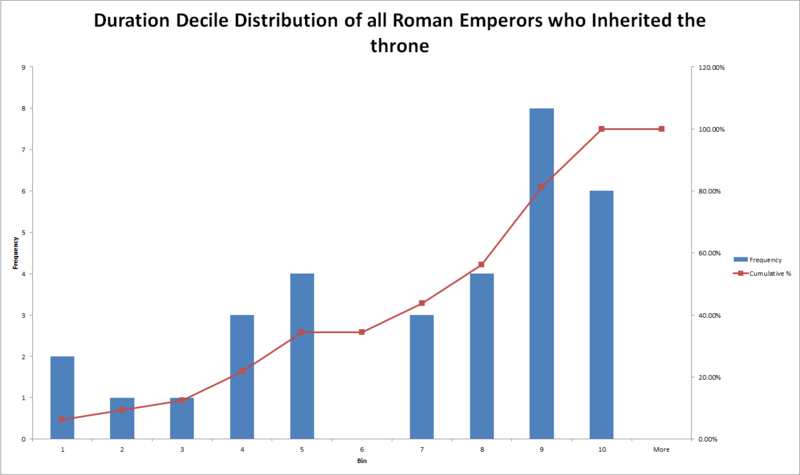 Having gotten stuck in the project that I am working on at the moment, I decided to pass the time and heal my frustrations by playing a little bit with Roman Empire Data. 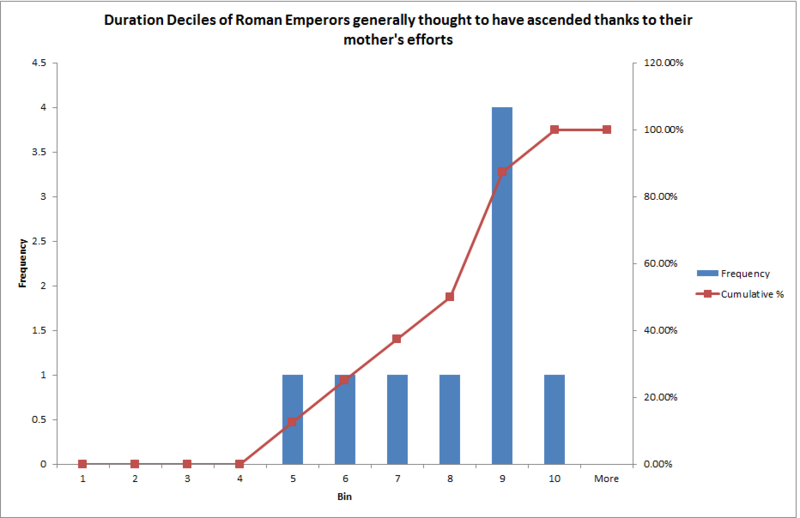 What I did was to match data for the duration of the Roman Empire with a few dummy variables on how each emperor rose to power. The data being what it is, what I found is purely descriptive. It does not really add anything that is particularly new, but at least it does not contradict common sense. Moreover, it is possible that by narrowing things down a little, it may hint at those things that matter most among those things we think matter. It turns out that a lobbying mother, inheritance and practice make for longer rules while getting to power through the support of some general makes for shorter rules. For some (subconscious) reason my focus ended up being on inheritance and career as determining factors regarding the rise to power. 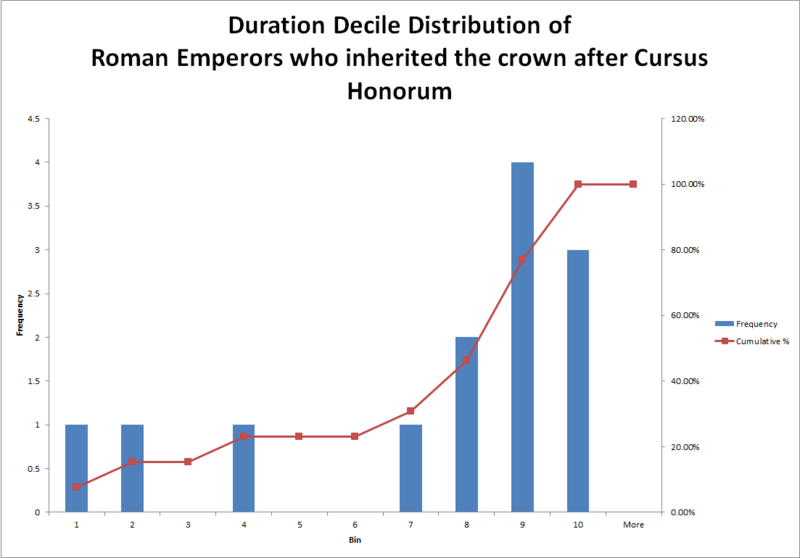 The figures below are histograms of the distribution of duration deciles of the rule of Roman Emperors. Click here to download the excel file with the data. The file makes the whole concept of the duration deciles clear. As far as staying in power for a long time, it seems that the best thing to do is to have a mother that wants you there . 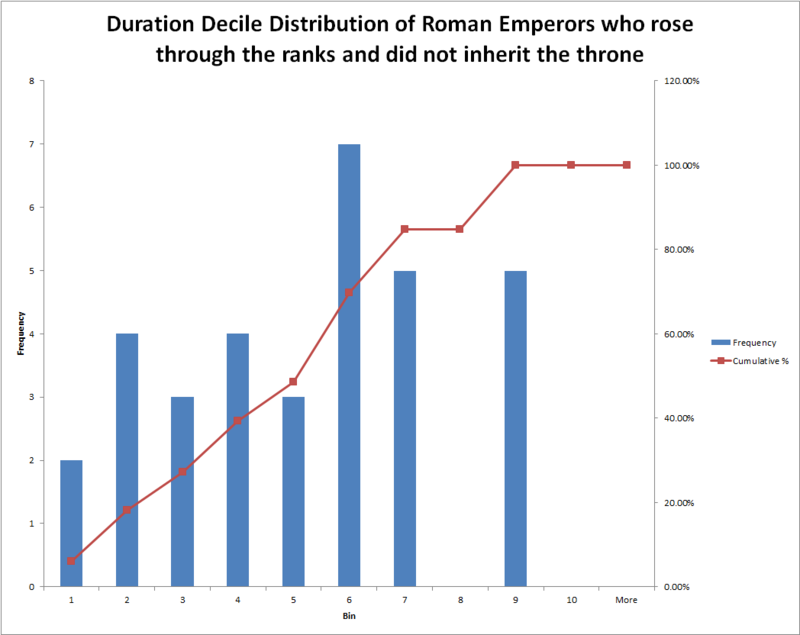 More generally, it seems that inheriting the Empire (of which the above selection is a subgroup) is associated with longer rules. A further refinement of the above selection suggests that if the said heirs to the throne are trained in the business of government, then their rule is even more likely to last long. 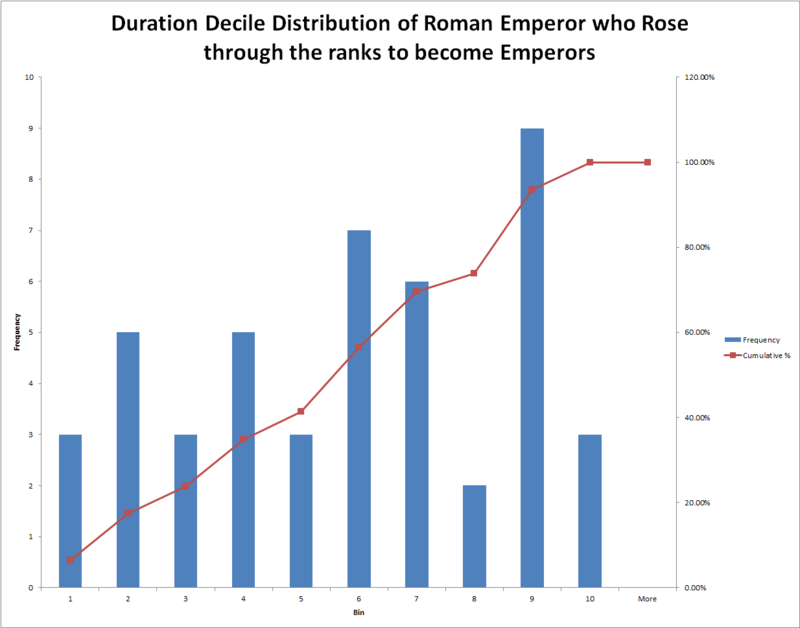 Interestingly, it does not seem to matter whether the Emperor simply rose through the ranks or only rose through the ranks (i.e. : if we include those that rose through the ranks and were heirs and those that rose through the ranks but did not inherit the crown). 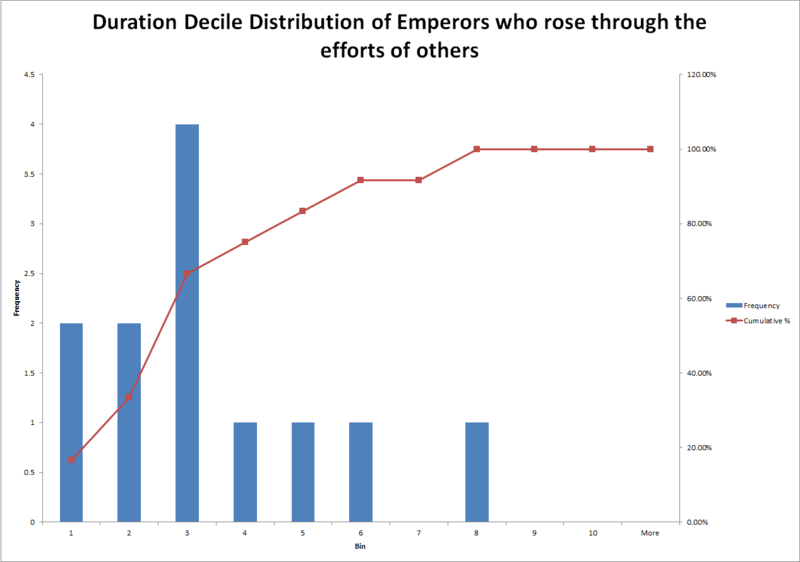 The impact of including rulers that rose through the ranks but did not inherit power is visible in the slight skewness of that distribution to the left. 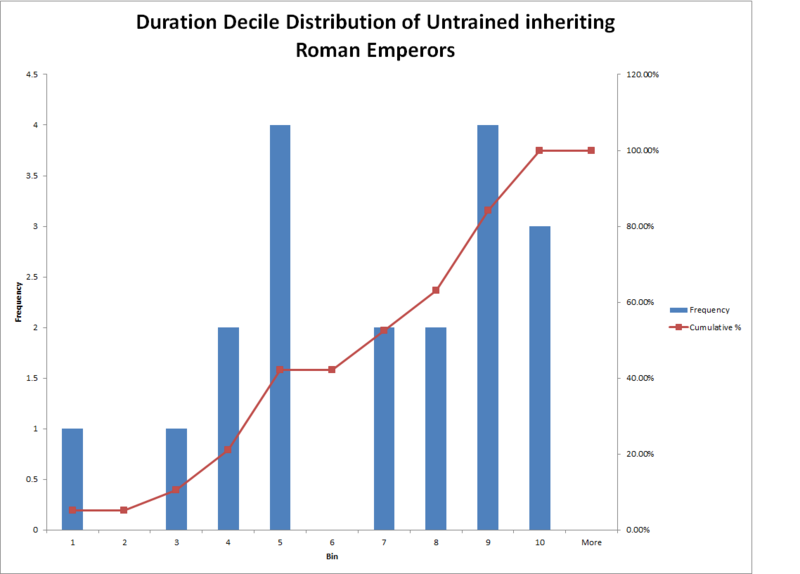 Surprisingly, the longevity of emperors who inherit but are not trained is not particularly skewed either way so that one advantage appears to cancel the other disadvantage. On the other hand, a surer recipe for short rule seems to involve gaining power through the efforts of others. Except for Claudius, the trend clearly seems to be for a short rule when one is chosen to be the puppet of others. I suspect all of this suggests that the 2 main ways to stay in power long is to be competent/trained and to have a decent and reliable network of supporters, loyal to the emperor and his family (read parents) rather than to some general. For some reason the links appear to be stronger. Figuring out why the links are stronger in one version but not in another is perhaps an interesting path for future research.